Johnny Williams is averaging 17 points and 4.5 points in this year’s Battle 4 Atlantis tournament. After a slow start Thanksgiving night against the Red Storm of St. John’s, VCU came roaring back to defeat the Big East team, earning a spot in this year’s 5th place game in the Battle 4 Atlantis tournament. It was the second game in as many days for the black and gold, letting an eight-point halftime lead get away from them against 20th-ranked Baylor to be relegated to the consolation side of this year’s bracket. 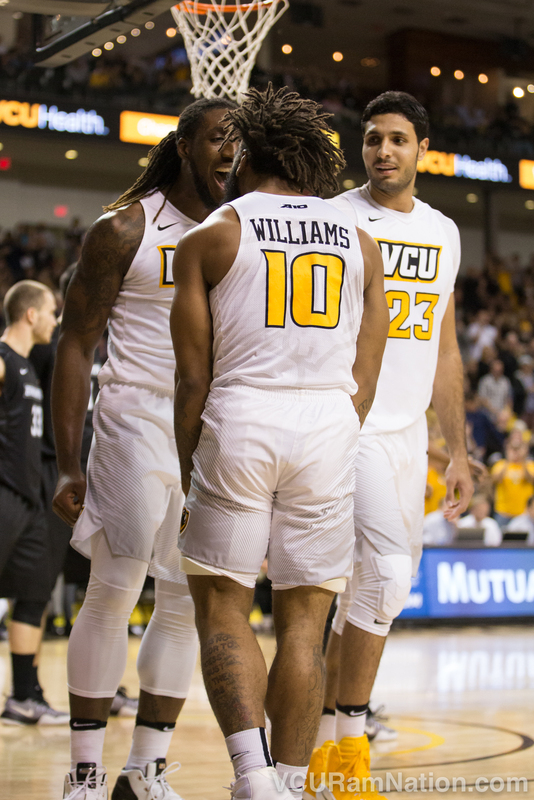 Still, after letting one get away, VCU has a shot at back-to-back wins over kenpom top-100 teams and a 2-1 finish to this year’s non-conference tournament. LSU stands in the Rams’ way however tonight after knocking off long-time Rams rival ODU last night, setting up the first meeting between VCU and LSU in the history of the two programs. The Tigers are coming off a disappointing 2015-16 season that ended with a second round SEC Tournament loss and no post-season tournament action despite being led by the No.1 overall pick in the 2016 NBA Draft, Ben Simmons. Following that showing expectations are extremely low for this year’s group, being picked to finish 12th out of 14 teams in what has been a disappointing SEC conference year after year. This year’s Tigers may be without Simmons but return as a more experienced group overall, a group expected to be led by sophomore guard Antonio Blakeney, a top-15 McDonald’s All-American out of high school. The Second Team All-SEC preseason pick is joined by a capable cast of sophomore’s including this year’s leading scorer, 6’10 235 big Duop Reath. Reath is a serious shot-blocker who gives the Tiger’s a nice presence in the paint, but one who can also step out and hit the occasional three. The Perth Australia product via the Sudan leads this year’s team with 15.4 points and 6.4 rebounds per game but was held in check against the Monarchs last night, scoring just four points in the win. Blakeney (14.4 ppg) and Reath are joined by fellow sophomore Brandon Sampson (11.8 ppg) as the team’s three double-digit scorers thus far this season. The 6’5 guard has struggled from distance this season but does a great job of attacking and finishing at the rim and almost never turns it over. Sampson’s three-point woes mirror that of the teams’ this season, as LSU has connected on just 29.6% of their threes this season. Defensively LSU has been solid but have faced just one top-100 offense this season, the result of that one being an 82-47 embarrassment Wednesday against the Shockers of Wichita State. The Rams have been somewhat of a rollercoaster ride through Atlantis, going up eight points at the half only to eventually lose by eight to Baylor, then going down 13 early to St. John’s before coming back to go up double-digits, eventually finishing Thanksgiving off with a six-point win. Will Wade and Co. are still searching for that complete game and will hope that comes tonight against the Tigers. For VCU the trick to this tournament and throughout the season has been in learning to defend without following. Percentage wise the Rams have defended the two-point and three-point shots well, but are averaging 24 fouls per contest in the Bahamas. Baylor turned those fouls into 27 freebies, outscoring the Rams by 13 at the stripe in that eight-point win. VCU accounted for five more fouls than the Red Storm Thursday night but still managed to outscore St. John’s 18-16 at the free throw line. In LSU VCU will face a team that hasn’t gotten many of their points from free throws this season. The Rams have been led by junior point guard Johnny Williams throughout this tournament. Williams scored a career-high 22 against SJU after dumping 12 points on Baylor on 6’9 shooting. He has nine assists to just two turnovers over the past two games. Williams has been joined by fellow point guard JeQuan Lewis as the two to put VCU on their backs throughout this tourney. Lewis is averaging 18 points and 3.5 assists through his two Caribbean contests to keep pace with Williams. The Rams once again come into a game with a big experience advantage and we all hope it shows tonight. VCU will need to play a poised game, limiting turnovers as they did last night but cutting down on the avoidable fouls as well. On paper there’s so much to love about VCU in this one but those percentages mean little if the Rams beat themselves by creating easy scoring opportunities at the stripe and turning it over on offense. LSU has shown no signs of being a three-point threat this season so it seems fair to say that if VCU can find ways to get offense inside the arch while forcing LSU to make tough shots from deep, the Rams should leave paradise with a respectable 2-1 B4A record. LSU gives themselves the best chance to win this one if they can win the paint tonight. VCU is shooting a very respectable 40.5% from three this season but gets the majority of their offense from attacking the basket — 53.4% of VCU’s points come from twos (90th nationally) while just 28.1% come from threes (210th). VCU is going to attack the basket so allowing the Rams any success there could make for a bad night for the Tigers. LSU simply has to win the paint to defeat VCU tonight, otherwise you’re country and a rare respectable three-point performance, which LSU has shown no sign of being capable of this season or all of last year as well. Kenpom: 77-69 VCU win with a 76% chance of a Rams victory. Watch: AXS TV, Official game day headquarters are Buffalo Wild Wings locations at Virginia Center and downtown on Cary Street in Shockoe Bottom.